The arrows flew and the nation was treated to some superb archery display, for they seem to hit everybody and everything else except the archer. Finally, their choice of targets exhausted, the arrows made their way back to Stamford Canal. Two months of amazing tai-chi solid investigative work and the conclusion, sobering. 2nd Shot: Where's the tree outside National Museum? 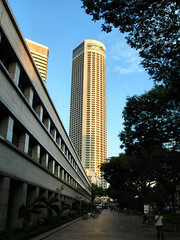 For over a century, the National Museum stand guard at the junction of Stamford and Orchard Road and bear witness to the changes in her surrounding. 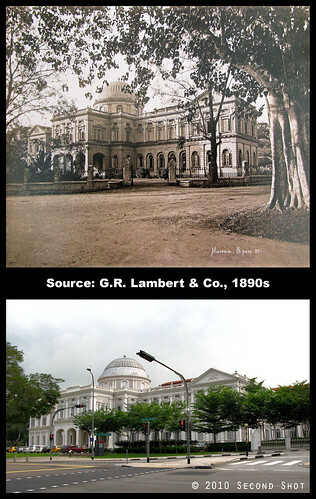 While geography has not changed - the building sitting at the foot of Fort Canning Hill and embraced by the gentle downslope curl of Fort Canning Road - a significant landmark visible in the old photo has gone missing. 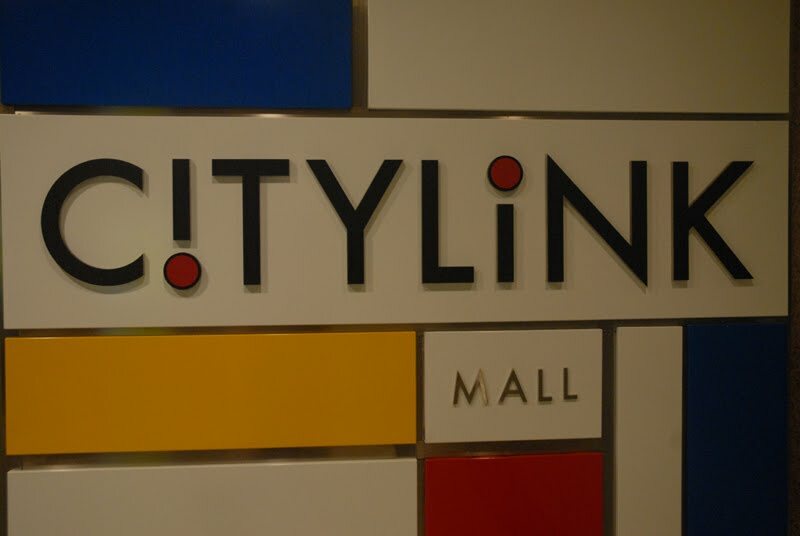 Even today, 10 years after CityLink Mall's opening in July 2000, I still have that magical feeling strolling along Singapore's first subterranean mall. 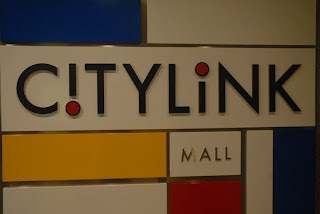 It seems pretty amazing to me from City Hall MRT Station, you can enter a passageway and somehow end up at Suntec City. I have never tried to orientate myself to the world outside and wonder what is actually above us everytime I follow the crowd blindly to my destination. A pity, as we can make some pretty interesting observations from the way CityLink is built. A lot of "second shot" has to do with the right timing and opportunity. The other day I chanced upon the above photo and wondered whether a second shot was still possible. As usual NAS does not tell us where exactly the photo was taken, only at Armenian Street. 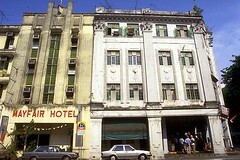 Singapore Infopedia gives only cursory mention of Mayfair City Hotel (visible in the photo) in its article on Armenian Street, which does not add much information. Where exactly was the Infamous Toilet in Bugis Street? In typical Singlish, "happening" would be too mild a word to describe Bugis Street. Back in the good o'days, before the squeaky clean cobblestoned Bugis Junction was bequeathed to us, 'Boogie Street' was known for the food, booze, transvestites and most dramatic of all, a fiery performance on top of a stinky public toilet.